X = simulate(mc,numSteps) returns data X on random walks of length numSteps through sequences of states in the discrete-time Markov chain mc. X = simulate(mc,numSteps,'X0',x0) optionally specifies the initial state of simulations x0. 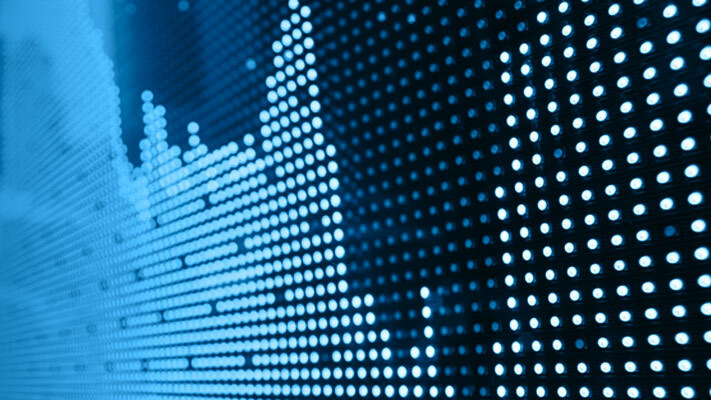 Run three 10-step simulations for each state. X is an 11-by-12 matrix. Rows corresponds to steps in the random walk. Columns 1–3 are the simulations that start at state 1; column 4–6 are the simulations that start at state 2; columns 7–9 are the simulations that start at state 3; and columns 10–12 are the simulations that start at state 4. 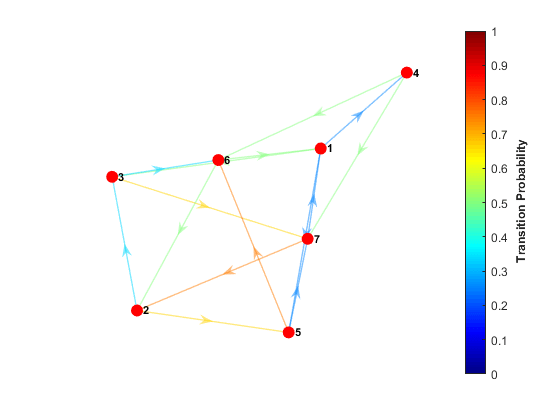 For each time, plot the proportions states that are visited over all simulations. Number of discrete time steps in each simulation, specified as a positive integer. Example: 'X0',[1 0 2] specifies simulating three times, the first simulation starts in state 1 and the final two start in state 3. Initial states of simulations, specified as the comma-separated pair consisting of 'X0' and a vector of nonnegative integers of NumStates length. 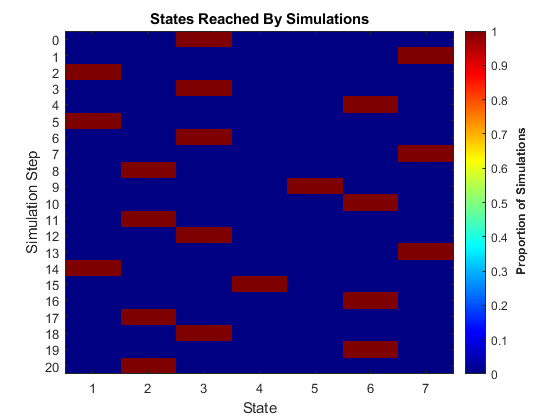 X0 provides counts for the number of simulations to begin in each state. The total number of simulations (numSims) is sum(X0). 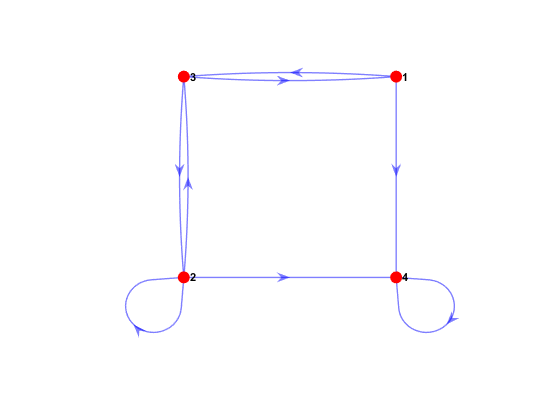 The default is a single simulation beginning from a random initial state. 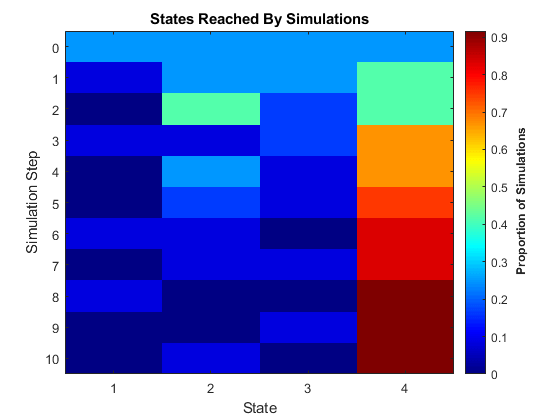 Indices of states visited during the simulations, returned as a (1 + numSteps)-by-numSims numeric matrix of positive integers. The first row contains the initial states. Columns, in order, are all simulations beginning in the first state, then all simulations beginning in the second state, and so on. To visualize the data created by simulate, use simplot.